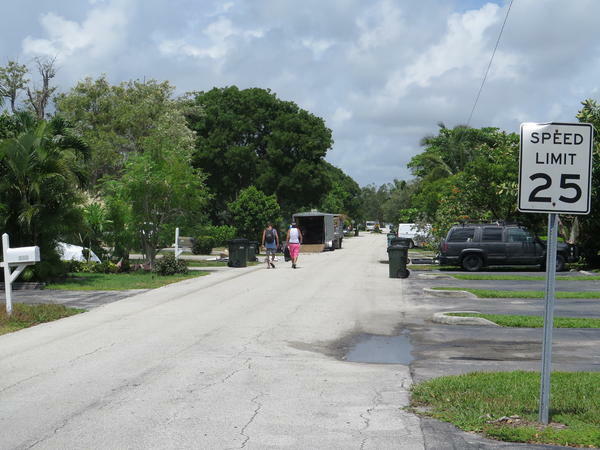 A recent study in Delray Beach identified at least six sober homes on this street alone. 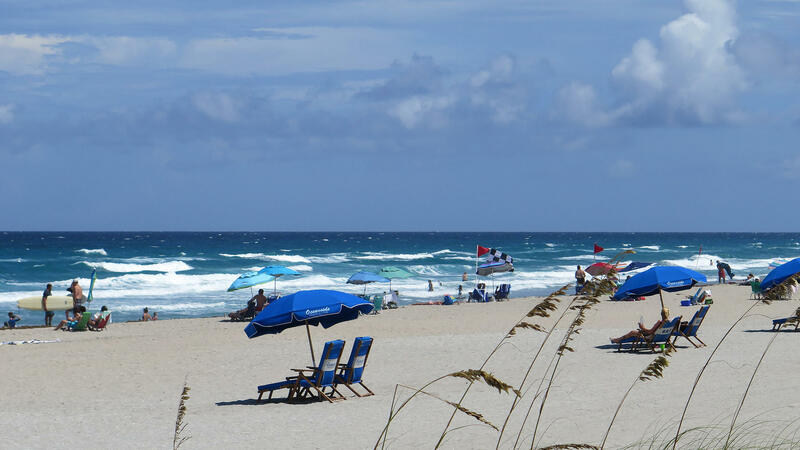 The surf and sand views of Delray Beach, Fla., draw residential drug recovery programs, as wells as tourists. Fire Rescue crews say they get overdose calls even from restaurants and shops in Delray Beach's downtown. 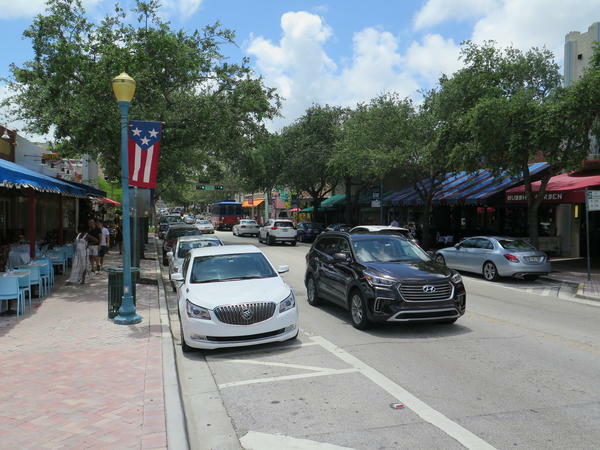 Delray Beach's charming downtown, palm trees and waves attract locals, vacationers and, increasingly, drug users who come here to try to get off opioids. In some parts of the small Florida community, there's a residential program for people recovering from addiction — a sober living house or "sober home" — on nearly every block. Sometimes two or three. On a block where resident Michelle Siegel was walking a dog recently, there are at least six sober homes. She says "you can usually tell" by the white vans and "no trespassing" signs out front. "I have walked down the street sometimes and seen kids just passed out, face down on the ground," she says. "And you ask them if they're OK and they're like, 'Yeah, yeah, I was just tired. I was sleeping.' And you don't know whether you should get them help; whether you should leave them alone." In South Florida, there's been runaway growth of these residential programs. As group homes for people recovering from addictions, sober homes are protected by the Americans with Disabilities Act and also the Fair Housing Act. Those federal laws have made it difficult for local communities to limit or otherwise regulate the facilities. And the nation's epidemic of opioid abuse has created new opportunities for insurance fraud. Under federal law, health care insurance pays for the costs of recovery. That's led to a boom in residential programs to treat addiction, and also growth in deceptive marketing by some programs, fraudulent claims and what's known as patient brokering. The state attorney for Palm Beach County, Dave Aronberg, convened a special task force to study opioid abuse and the drug recovery industry, with a report released early this year. Aronberg says while there are many legitimate sober homes, there are also many others operated by unscrupulous providers. They tap into insurance money by offering free rent and getting kickbacks from outpatient drug treatment centers. Aronberg calls the practice of "patient brokering" a scheme. "The outpatient treatment center van picks your residents up three times a week to go drug test them," he says, "which is then billed to insurance at very high rates." Treatment centers bill insurance companies not just for drug tests but also for other services, like group counseling, massage and acupuncture. They share the money with the people supplying the patients, Aronberg says. "In return," he says, "you as a sober home owner, you get a nice check for patient brokering — which is what you've done." Although they're in Delray Beach for recovery, residents of sober homes can find easy access to heroin and other drugs. The city's fire rescue crews responded to more than 1,300 overdose calls last year — many at sober homes. "We respond there sometimes repeatedly in the same shift," says Matt Pearce, an EMS captain. On one recent night, he says, "they responded to the same sober home two times within 10 minutes, both for overdoses." With a cost of $2,500 for each EMS call, these overdoses have put a strain on the city's budget. Much worse is the human toll. Countywide, nearly 600 people died of overdoses last year. It's a problem for Delray Beach and for people with addictions who are often lured by marketers to South Florida on false pretenses. "They make the individual on the other line think that they're a doctor and they're diagnosing them," Aronberg says, "when, in reality, they're only reading from a script given to them by the treatment center which is paying them." Rather than operating on a recovery model, Aronberg says, unscrupulous sober homes and treatment centers operate on a "relapse cycle," which bring clients back time and again for treatment that is covered by health insurance. Neill Timmons has seen how reputable facilities can work — from both sides. "I'm in recovery myself," he says, "six years next month." Timmons runs four houses for sober living in another Palm Beach county community, Boynton Beach. Like other reputable operators, he doesn't receive payments through arrangements with drug treatment centers. He says for someone going through recovery, landing in a good sober home can make all the difference. Of his residents, he says, "They're not certain ... if they want to stay sober the rest of their lives or return back to use. And they're struggling with what they need to do ... if they do want to stay sober." A good facility, he says, "should really guide and give them some guidance toward recovery." Timmons and others who run good facilities want more regulation. They're pleased by a law, recently signed by Florida's governor, that increases the penalties for patient brokering and deceptive marketing. A study commissioned by Delray Beach, and released in May, found at least 250 sober homes in a town of just 60,000 — about a quarter of them operating under the city's radar. The town's mayor, Cary Glickstein is no fan of the drug recovery industry and sober homes — or of the problems he says they've brought to his city. He runs down the list — "patient brokering, drug trafficking, human trafficking, prostitution. It's a Pandora's Box of problems that the unscrupulous operators bring to a community." Glickstein is confident a new ordinance just adopted by Delray Beach will enable the city to crack down on sober homes. It requires them to be certified by an independent trade association and limits their presence to no more than one per block. After adopting a similar ordinance, officials in Prescott, Ariz., say the number of sober homes in their community is now a third of what it once was. The nation's epidemic of opioid abuse has created new opportunities for insurance fraud. Health care insurance pays for the costs of recovery. That's led to a boom in residential treatment programs for addicts, some of which use deceptive marketing, fraudulent claims and what's known as patient brokering. In South Florida, that's led to a runaway growth of residential programs for recovering addicts called sober homes. From Delray Beach, NPR's Greg Allen reports. GREG ALLEN, BYLINE: Delray Beach is a small Florida community with a charming downtown, palm trees and waves. It attracts locals, vacationers and increasingly addicts, who come here to try to get off opioids. In some parts of town, there's a sober home on nearly every block and sometimes two or three. On this block, where Michelle Siegel was walking a dog, there are at least six sober homes. MICHELLE SIEGEL: You can usually tell. A lot of times, they have the white vans in front. And they have the do-not-trespassing signs. But I have walked down the street sometimes and seen kids just passed out, face down on the - and you ask them if they're OK. And they're like, yeah, yeah, I was just tired. I was sleeping. And you don't know whether you should get them help, whether you leave them alone. ALLEN: As group homes for people recovering from addictions, sober homes are protected by the Americans With Disabilities Act, also, the Fair Housing Act. Those federal laws have made it difficult for local communities to limit or otherwise regulate sober homes. The state attorney for Palm Beach County, Dave Aronberg, says while there are many legitimate sober homes, there are also many others operated by unscrupulous providers. Aronberg says they tap into insurance money, offering free rent and getting kickbacks from outpatient drug treatment centers, a scheme known as patient brokering. DAVE ARONBERG: The outpatient treatment center van picks your residents up three times a week to go drug test them, which is then billed to insurance at very high rates. ALLEN: Treatment centers bill insurance companies not just for drug tests but also for other services like group counseling, even acupuncture. And they share the money with people supplying the patients. ARONBERG: In return, you, as a sober homeowner, can get a nice check for the patient brokering - is what you've done. ALLEN: Although they're there for recovery, residents of sober homes often find heroin and other drugs available. COMPUTER-GENERATED VOICE: Rescue 111, responding to area 111. ALLEN: Delray Beach EMS Captain Matt Pearce says crews responded to more than 1,300 overdose calls last year, many at sober homes. MATT PEARCE: We respond there sometimes repeatedly in the same shift. Just last night, they responded to the same sober home two times within 10 minutes, both for overdoses. ALLEN: With a cost of $2,500 for each EMS call, it's put a strain on the city's budget. Much worse is the human toll. Countywide, nearly 600 people died of overdoses last year. It's a problem for Delray Beach and for addicts, who Aronberg says are often lured by marketers to South Florida on false pretenses. ARONBERG: They make the individual on the other line think that they're a doctor and they're diagnosing them, when in reality, they're only reading from a script given to them by the treatment center that's paying them. ALLEN: Rather than a recovery model, Aronberg says unscrupulous sober homes and treatment centers operate on a relapse cycle, which brings clients back time and again for treatment covered by health insurance. NEILL TIMMONS: You know, I'm in recovery myself, six years next month. ALLEN: Neill Timmons runs four sober homes in another Palm Beach County community, Boynton Beach. Like other reputable operators, he doesn't receive payments through arrangements with drug treatment centers. He says for someone going through recovery, landing in a good sober home can make all the difference. TIMMONS: They're not certain, you know, if they want to stay sober the rest of their lives or return back to use. And they're, you know, just struggling with what they need to do in order - if they do want to stay sober, so, I mean, a good sober support to really guide and give them some guidance towards recovery. ALLEN: Timmons and others who run good sober homes want more regulation. Florida's governor recently signed a law increasing the penalties for patient brokering and deceptive marketing. A study commissioned by Delray Beach found at least 250 sober homes in a town of just 60,000, about a quarter of them operating under the city's radar. Mayor Cary Glickstein is no fan of the drug recovery industry, sober homes and the problems, he says, they brought to his city. CARY GLICKSTEIN: Patient brokering, drug trafficking, human trafficking, prostitution - it's a Pandora's box of problems that the unscrupulous operators bring to a community. ALLEN: Delray Beach has just adopted a new ordinance that requires sober homes to be certified by an independent trade association. After adopting a similar ordinance, officials in Prescott, Ariz., say the number of sober homes in their community is now a third of what it once was. Greg Allen, NPR News, Delray Beach, Fla.
(SOUNDBITE OF EXPLOSIONS IN THE SKY'S "HUMAN QUALITIES") Transcript provided by NPR, Copyright NPR.